We started with a brief run-down of the cheese-making process and the all important raw ingredient, the milk, which in this case all comes from a single farm in Rye, East Sussex. Into the milk goes a starter culture, much like a sourdough bread. 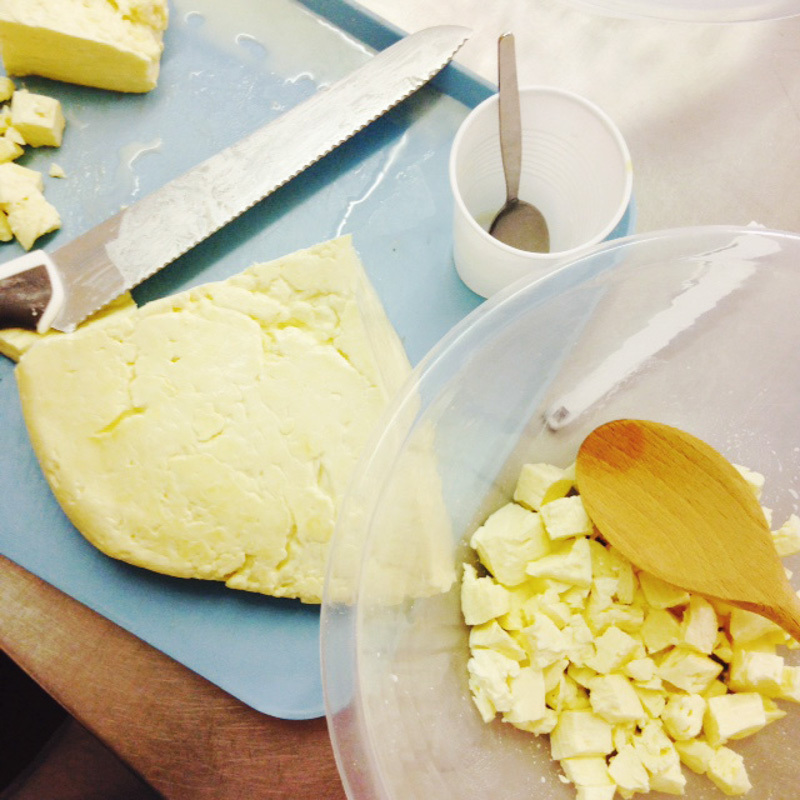 It takes ten litres of milk to make a kilo of cheese, so Wilde’s get through quite a lot of milk. Wilde’s only use unhomegenised milk – this means that the milk fats and liquids have not been separated then mixed back together as occurs in nearly all supermarket milks. That little factoid also explain why you never get a lovely layer of cream on top of top full-fat milk any more: homegenised milk never separates itself out again. 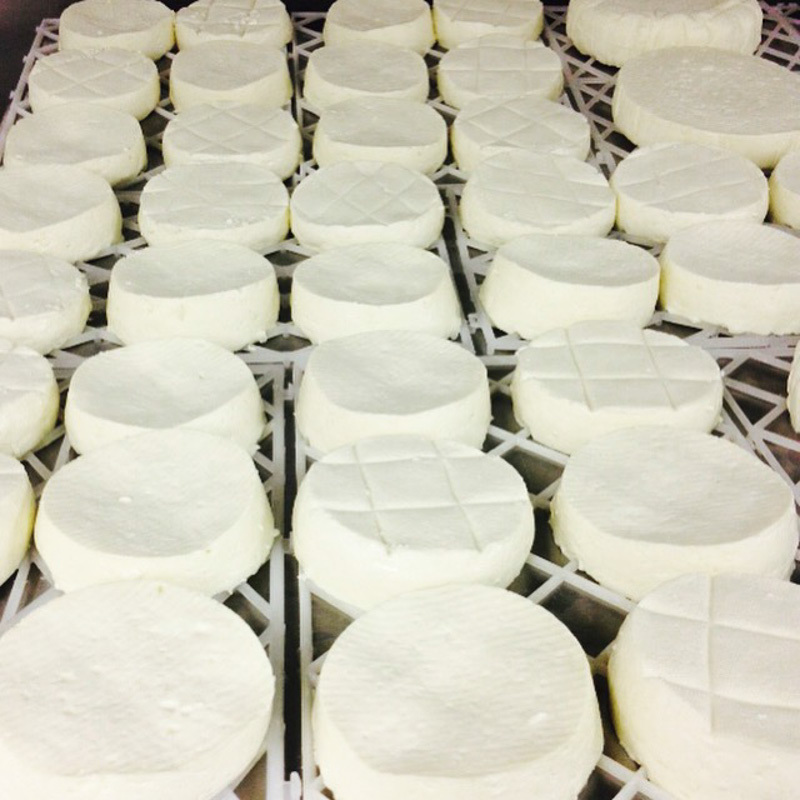 Temperature and humidity while the cheese ripens is key, and often varies depending on the type of cheese – soft cheeses work better in a higher temperature with more humidity. 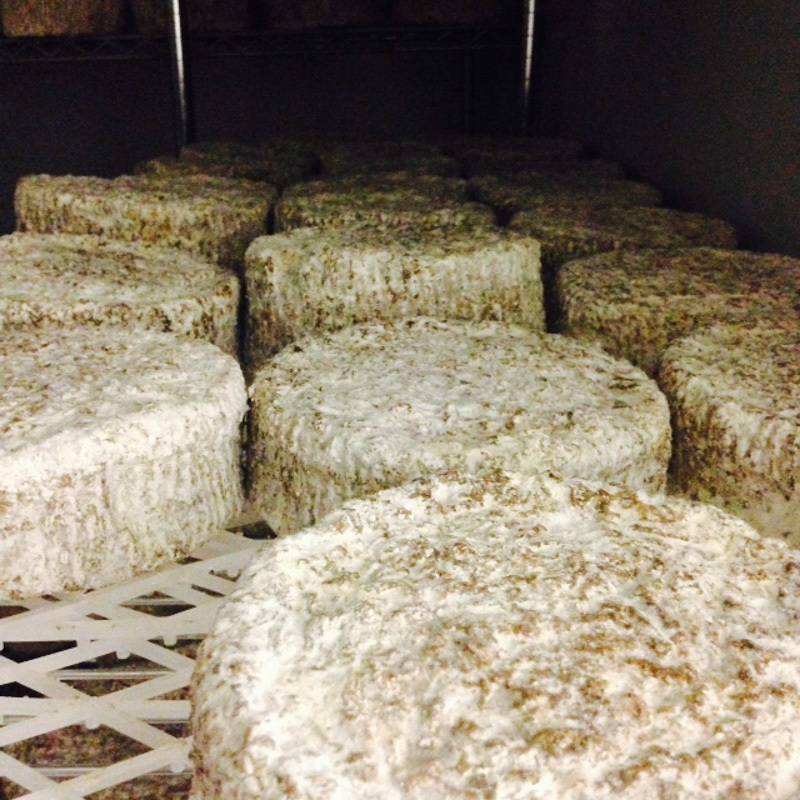 Wilde’s partner Keith showed us the dark, humid room where some of the funkier cheeses are left to mature. They do a lot of experimenting and micro-tweaking of conditions to get the results they’re after. Shape affects the texture and flavour a surprising amount too – you get less all-important goo in the middle of a smaller wheel. Back to the mozzarella at hand, which is luckily a relatively simple affair and definitely all do-at-home-able. 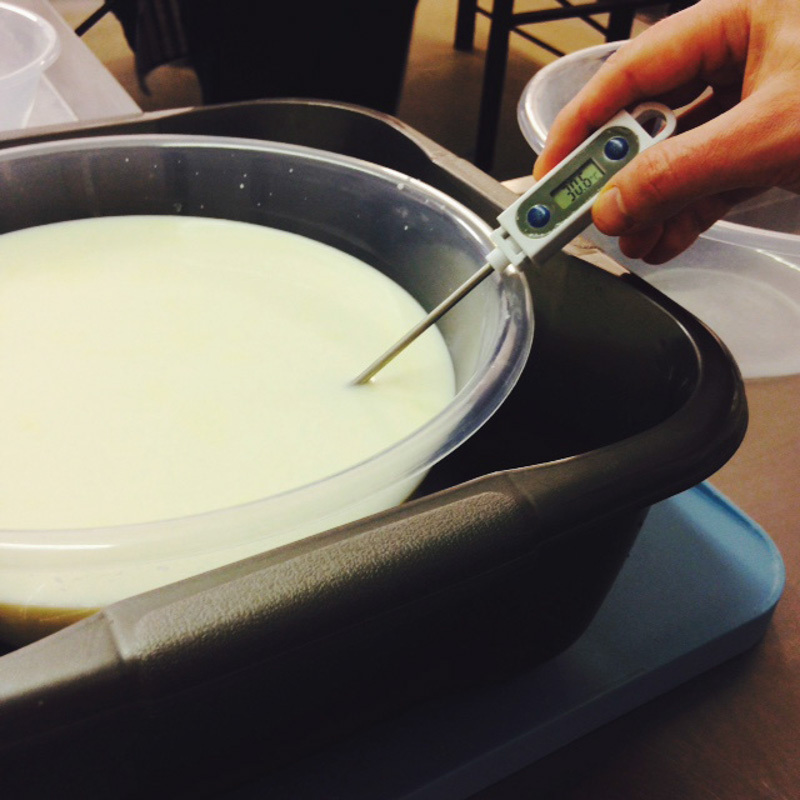 The ripening process happens in a bain marie to keep the milk at 30 degrees for an hour or so. Then rennet is added to split out the curds (solids) from the whey (liquids) – Wilde’s get mega points from me because they only use vegetarian rennet, hurrah. Then after a cheesy pit stop to sample some of Wilde’s range..
…It was onto the main work of the evening, doing the process that gives mozzarella its bounce and stretch factor. 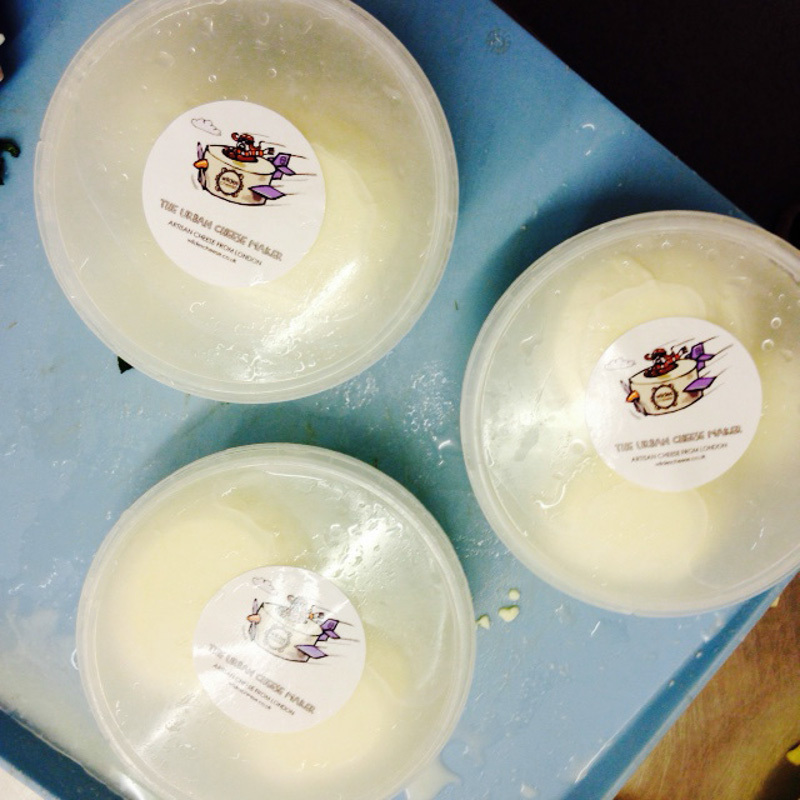 The curds are chopped into small chunks and slowly melted and amalgamated in near-boiling water. You then need to grab it and twist it into the characteristic balloon shape – or a twist or plait if you’re feeling fancy. Finally, we popped our handiwork in little pots ready to take home. 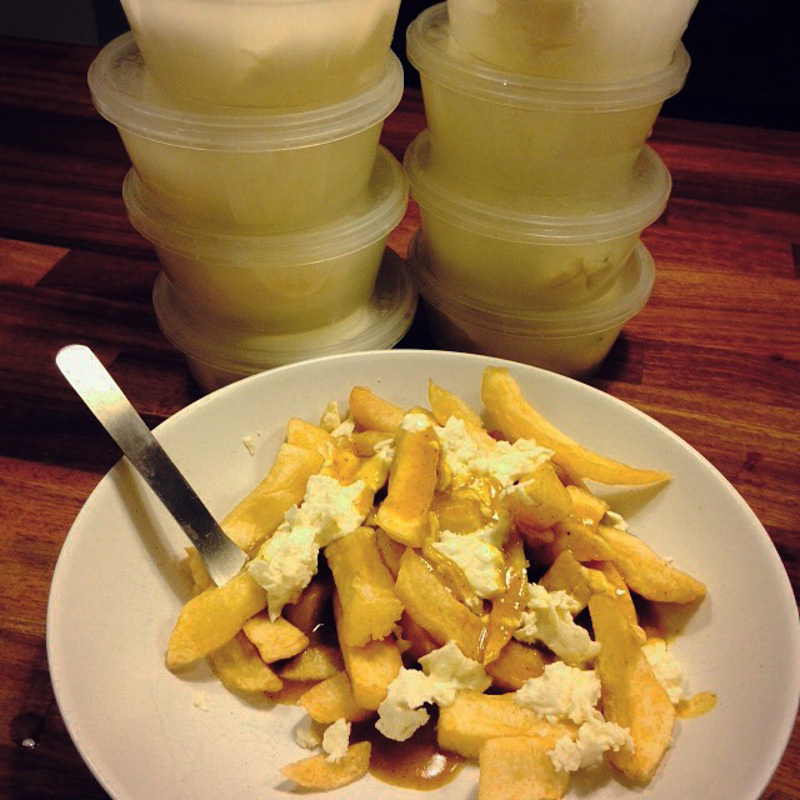 I’m a little ashamed to admit that on the way home we had the amazing idea to stop at the chippy and make makeshift poutine with our extremely fresh curds. Just what you need after a night downing cheese, right? I’m not even ashamed really, it was amazing. And we’ve been slowly working through our huge mozzarella stash, using it in everything from a fresh triciolore salad to another slow-fermented pizza. 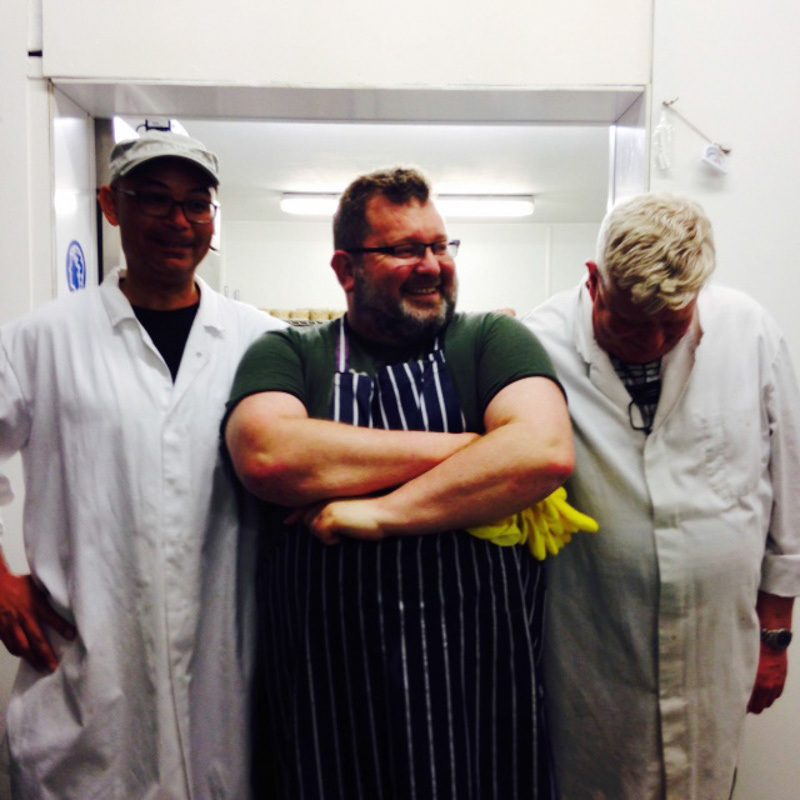 Thank you so much to the charming Wilde’s team – Rodolfo, Philip and Keith – for such a fun and informative evening. 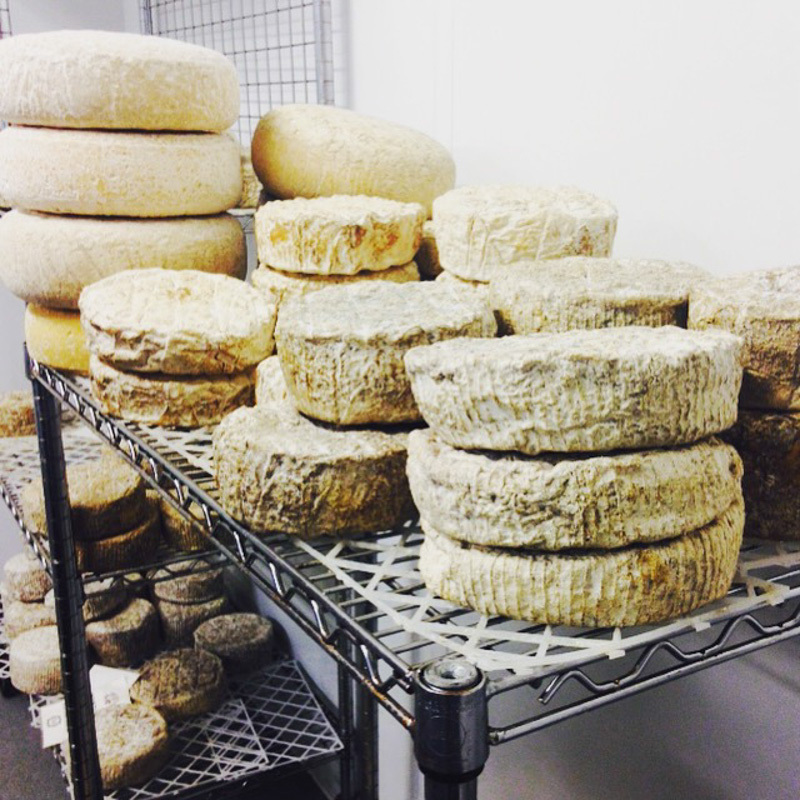 Check out Wilde’s site for more cheese-making evening and day classes coming up, and you can get hold of their amazing cheeses at Borough Market or online (Napier is my personal favourite). It was really fun, and only fuelled my love of cheese more! We’ve tried making soft goats cheese at home before and that turned out half decent, but I’d absolutely love to make fresh mozarella! It looks absolutley amazing there and I love that they use proper ingredients too! I bet it tasted so delicious compared to shop bought stuff! Yum, I love goats cheese! Oh, I love Wilde’s cheese, it’s on the menu in our local library’s cafe of all places (in Enfield – really good coffee too). 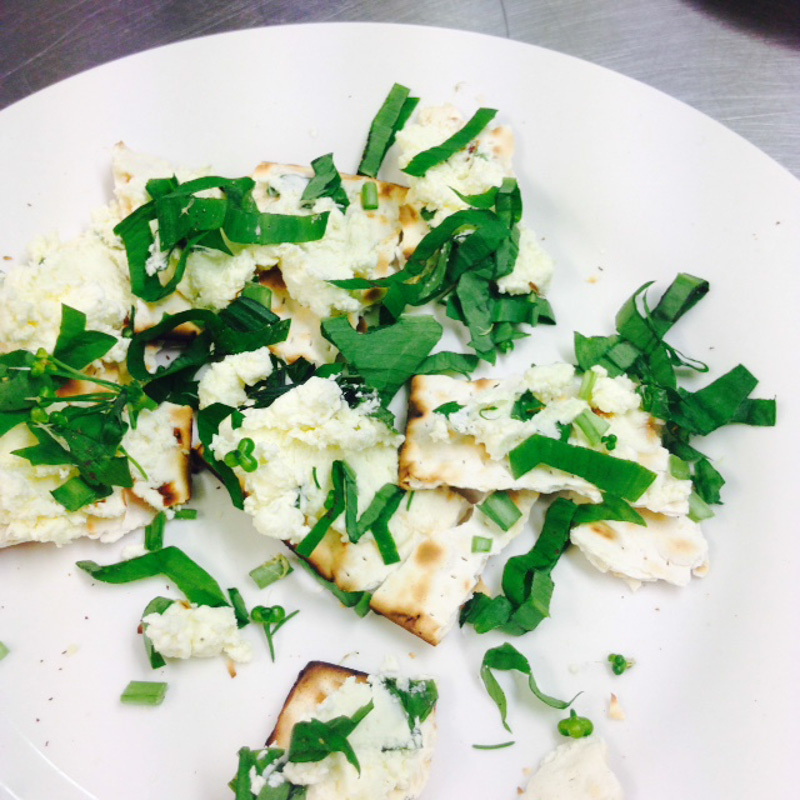 Love the idea of doing the mozzarella course! Sounds like a pretty awesome library. I always have to pop down to Borough Market to get my Wilde’s fix. This looks AMAZING! I cannot believe I have never heard of this place! Thanks so much for the post. I attended their cheese making course yesterday. This morning I enjoyed a soft curd cheese on toast and a melted mozzarella on toast both of which I made yesterday! Very tasty it is, too. Love Wildes!